On average the costs are very equally shared, with one exception in an Italian Province that had higher tangible costs (as it actually paid external contractors and services for most of the OSS activity) and a small municipality that for budget reasons shifted most of the work internally as immaterial expenses in a very significant way; the measure is also skewed by the small size of the experiment for this particular case. The measures performed in the other experiments confirm the approximate range of tangible vs. intangible; while there is some variability, the relative error is quite small. Some best practices provide a reduction of the impact of negative factors and at the same time increase the impact of positive ones, like “Seek out advice or search for information on similar transitions: As the number of companies and administrations that have already performed a migration is now considerable, it is easy to find information on what to expect and how to proceed” covers both the negative “no other successful example of OSS migration in the same sector” and the positive “support from other OSS users”. As a conclusion: there is a way to substantially increase the probability of doing a successful OSS adoption/migration, and the way goes through some simple and fact-based methods. Also, the spectre of ultra-high TCO for OSS migration can be banned through a single multiplication, to get the real numbers. If some company claims that OSS costs too much, first of all ask where they get their data from. If it is from a model, show them that reality (may) be different. Of course, if you insist of doing everything wrong, the costs may be high. But I’m here for a reason, no? The slightly higher cost for the OSS part is related to the fact that an external consultancy was paid to provide the support. An alternative strategy could have been to retrain the staff for Linux support, using consultancies only in year 1 and 2- leading to an estimated total cost for the OSS solution exactly in line with the proprietary one. The municipalities also performed an in-depth analysis of efficiency; that is, documents processed per day, comparing openoffice and MS office. This was possible thanks to a small applet installed (with users and unions consent) on the PC, recording the user actions and the applications and files used during the migration evaluation. It was found that users were actually *more* productive with OOo in a substantial way. This is probably not related to a relative technical advantage of OOo vs. MS office, but on the fact that some training was provided on OpenOffice.org before beginning the migration – something that was not done before for internal personnel. So many users actually never had any formal training on any office application, and the limited (4 hours) training performed before the migration actually substantially improved their overall productivity. On the other hand, it is clear that OOo is – from the point of view of the user – not lowering the productivity of employees, and can perform the necessary tasks without impacting the municipality operations. The migration was done in two steps; a first one (groupware, content management, openoffice) and a second one (ERP, medical image management). The hospital does have a much larger saving percentage when compared with other comparable cases because they were quite more mature in terms of OSS adoption; thus, most of the external, paid consulting was not necessary for their larger migration. This information is also something that can be reused and disseminated among similar groups; for example, the information on suitability of a backup solution for municipalities can be spread as a “best practice” among similar users, thus reducing the cost of searching and evaluating it. If such a widespread practice can be performed, we estimate that OSS adoption/migration costs can be reduced of something between 17% and 22% with just information spreading alone. On average, the cost of migration (tangible vs. intangible) was nearly equal with one exception that was 27% tangible vs. 73% intangible, due to the pressure to use older pcs, and reuse resources when possible for budgetary reasons. In general, if you want to know the “real” TCO, simply take your material costs and multiply by two. Rough, but surprisingly accurate. Both in COSPA, OpenTTT and our own consulting activity we found that 70% of users *do not need* external support services after the initial migration is performed. For example, while most of COSPA users paid for server support fees for RedHat Enterprise, a substantial percentage could have used a clone like Centos or Oracle linux with the same level of service and support. Also, while not universally possible, community-based support has been found sufficient and capable in a large number of environments. A problem with community support has been found in terms of “attitude”; some users accessed the forums with the same expectations of a paid offering, seriously damaging the image and possibility of support (something like “I need an answer NOW or I’ll sue you!” sent to a public support forum for an open source product). For this reason, we have suggested in our best practices to have a single, central point of contact between the internal users and the external OSS communities that is trained and expert in how OSS works to forward requests and seek solutions. This can reduce, after initial migration and a 1-2 year period of “adaptation”, support costs by shifting some of the support calls to communities. This can reduce costs of a further 15-20% on average. As I said, this is a little, unscientific experiment designed to explore what we can invent to better measure the “impact” of an OSS project. I would love to receive you comments and suggestions; on my side, I will try to leverage the FLOSSMETRICS database to try to find some numbers on a more consistent data sample. The debate on whether the GPL is going the way of the dodo or not is still raging, in a way similar to the one on open core – not surprisingly, since they are both related to similar aspects, that intermingle technical and emotional aspects. A recent post from BlackDuck indicates that (on some metric, not very well specified unfortunately) the GPLv2 for the first time dropped below 50%; while Amy Stephen points out that the GPLv2 is used in 55% of the new projects (with the LGPL at 10%), something that is comparable to the results that we found in FLOSSMETRICS for the stable projects. Why such a storm? The reason is partly related to a strong association of the GPL with a specific political and ethical stance (an association that is, in my view, negative in the long term), and partly because the GPL is considered to be antithetic to so-called “open core” models, where less invasive licenses (like the Apache or Eclipse licenses) are considered to be more appropriate. We must insure that customers using our enterprise version are not locked into that choice and that open source is available to them. To that end, the core system and interfaces will remain 100% open source. Enterprise customers will receive fixes as a priority, but that we will make these fixes available in the next labs release. Bugs fixed by the community are delivered to the community as a priority. We will provide extensions and integrations to proprietary systems to which customers are charged. It is fair for us to charge and include this in an enterprise release as well. Extensions and integrations to ubiquitous proprietary systems, such as Windows and Office, will be completely open source. I previously noted that with the Open-Core approach the open source disruptor is disrupted by its own disruption and that in the context of Christensen’s law of Conservation of Attractive Profits it is probably easier in the long-term to generate profit from adjacent proprietary products than it is to generate profit from proprietary features deployed on top of the commoditized product. The GPL is well understood by the market and the legal community and has notable precedents such as MySQL, Java and the Linux kernel as GPL licensed projects. The GPL ensures that the software remains open and that companies do not take our products and sell against us in the marketplace. If this happened, we would not be able to sufficiently invest in the project and everyone would suffer. The GPL family, at the moment, has the advantage that the majority of packages are licensed under one of such licenses, making compatibility checking easier; also, there is an higher probability of finding a GPL (v2, v3, AGPL, LGPL) package to improve than starting for scratch – and this should also guarantee that in the future the license mix will probably continue to be oriented towards copyleft-style restrictions. Of course, there will be a movement towards the GPLv3 (reducing the GPLv2 share, especially for new projects) but as a collective group the percentages will remain more or less similar. This is not to say that the GPL is perfect: on the contrary, the text (even in the v3 edition) lacks clarity on derivative works, has been bent too much to accommodate anti-tivoization clauses (that contributed to a general lack of readability of the text) and lacks a worldwide vision (something that the EUPL has added). In terms of community and widespread adoption the GPL can be less effective as a tool for creating widespread platform usage; the EPL or the Apache license may be more appropriate for this role, and this because the FSF simply has not created a license that fullfills the same role (this time, for political reasons). What I hope is that more companies start the adoption process, under the license that allows them to be commercially sustainable and thriving. The wrong choice way hamper growth and adoption, or may limit the choice of the most appropriate business model. The increase in adoption will also trigger what Matthew Aslett mentioned as the fifth stage of evolution (still partially undecided). I am a strong believer that there will be a move toward consortia-managed projects, something similar to what Matthew calls “the embedded age”; the availability of neutral third-party networks increase the probability and quality of contributions, in a way similar to the highly successful Eclipse foundation. One of the activities we are working on to distract ourselves from the lure of beaches and mountain walks is the creation of a preliminary model of actor/actions for the OSS environment, trying to estimate the effect of code and non-code contributions and the impact of OSS on firms (adopters, producers, leaders – following the model already outlined by Carbone), and the impact of competition-resistance measures introduced by firms (pricing and licensing changes are among the possibility). 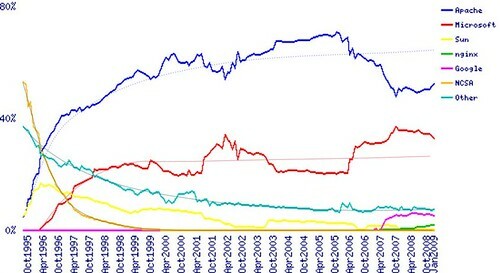 We started with some assumptions on our own, of course; first of all, rationality of actors, the fact that OSS and traditional firms do have similar financial and structural properties (something that we informally observed in our study for FLOSSMETRICS, and commented over here), and the fact that technology adoption of OSS is similar to other IT technologies. 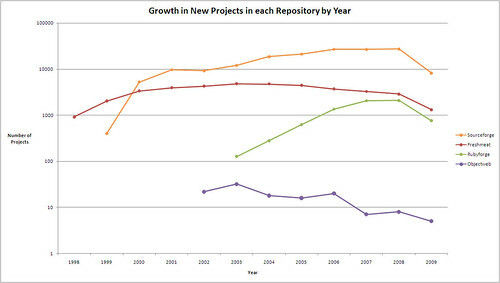 It is relatively easy to see the reduction in the number of new projects in forges, that is only partially offset by new repositories not included in the analysis like Googlecode or Codeplex; this reduction can be explained by the fact that with an increasing number of projects, it is easier to find an existing project to contribute to, instead of creating one anew. An additional explanation is the fact that commercial OSS companies are moving from the traditional hosting on Sourceforge to the creation of internally managed and public repositories, where the development process is more controlled and manageable; my expectation is for this trend to continue, especially for “platform-like” products (an example is SugarForge). What does it means? That licensing issues are the main reason for publishing back, but separated by very few percentage points other reasons appear: the signaling advantage (being good players), the R&D sharing, and many others. In this sense, my view is that the GPL creates an initial context (by forcing the publication of source code) that creates a secondary effect – reuse and quality improvement – that appears after some time. In fact, our research shows that companies need quite some time to grasp the advantages of reuse and participation; the GPL enforces participation for enough time that companies discovers the added benefits, and start moving their motivations to economic reasons, as compared to legal enforcing or legal risks. Right on the heels of the 451 group’s CAOS 12 report, I had the opportunity to perform a comparison between monetization modalities that we originally classified as open core in the first edition of our work with the more recent database of OSS companies and their adopted models (such an analysis can be found in our guide as well). An interesting observation was the shifting perspective on what open core actually is, and to present some examples on why I believe that the “original” open core nearly disappeared, while a “new” model was behind the more recent claims that this has become one of the preferred models for OSS companies. In the beginning, we used as a classification criteria the distinction of code bases: an Open Core company was identified by the fact that the commercial product had a different source code base (usually an extension of a totally OS one), and the license to obtain the commercial was exclusive (so as to distinguish this from the “dual licensing” model). In the past, open core was more or less a re-enactment of shareware of old; that is, the open source edition was barely functional, and usable only to perform some testing or evaluation, but not for using in production. The “new” open core is more a combination of services and some marginal extension, that are usually targeted for integration with proprietary components or to simplify deployment and management. In this sense, the “real” part of open core (that is, the exclusive code) is becoming less and less important – three years ago we estimated that from a functional point of view the “old” open core model separated functions at approximately 70% (the OS edition had from 60% to 70% of the functions of the proprietary product), while now this split is around 90% or even higher, but is complemented with assurance services like support, documentation, knowledge bases, the certification of code and so on. Just to show some examples: DimDim “We have synchronized this release to match the latest hosted version and released the complete source code tree. Bear in mind that features which require the Dimdim meeting portal (scheduling & recording to note) are not available in open source. There is also no limit to the number of attendees and meetings that can be supported using the Open Source Community Edition.” If you compare the editions, it is possible to see that the difference lies (apart from the scheduling and recording) in support and the availability of professional services (like custom integration with external authentication sources). Alfresco: The difference in source code lies in the clustering and high-availability support and the JMX management extensions (all of which may be replicated with some effort by using pure OSS tools). Those differences are clearly relevant for the largest and most complex installations; from the point of view of services, the editions are differentiated through availability of support, certification (both of binary releases and of external stacks, like database and app server), bug fixing, documentation, availability of upgrades and training options. Cynapse (an extremely interesting group collaboration system): The code difference lies in LDAP integration and clustering; the service difference lies in support, availability of certified binaries, knowledgebase access and official documentation. During the compilation of the second FLOSSMETRICS database I found that the majority of “open core” models were actually moving from the original definition to an hybrid monetization model, that brings together several separate models (particularly the “platform provider”, “product specialist” and the proper “open core” one) to better address the needs of customers. 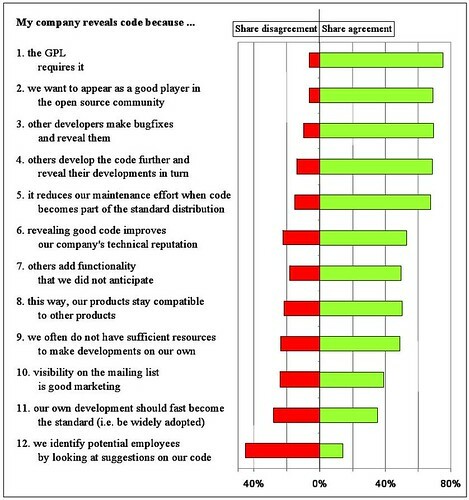 The fact that the actual percentage of code that is not available under an OSS license is shrinking is in my view a positive fact: because it allows for the real OSS project to stand on its own (and eventually be reused by others) and because it shows that the proprietary code part is less and less important in an ecosystem where services are the real key to add value to a customer. It has been an absolutely enjoyable activity to work in the context of the FLOSSMETRICS project with the overall idea of helping SMEs to adopt, and migrate to, open source and free software. My proposed approach was to create an accessible and replicable guide, designed to help both those interested in exploring what open source is, and in helping companies in the process of offering services and products based on OSS; now, two years later, I found references to the previous editions of the guide in websites across the world, and was delighted in discovering that some OSS companies are using it as marketing material to help prospective customers. So, after a few more months of work, I am really happy to present the fourth and final edition of the guide (PDF link) that will (I hope) improve in our previous efforts. For those that already viewed the previous editions, chapter 6 was entirely rewritten, along with a new chapter 7 and a newly introduced evaluation method. The catalogue has been expanded and corrected in several places (also thanks to the individual companies and groups responsible for the packages themselves) and the overall appearance of the PDF version should be much improved, compared to the automatically generated version. I will continue to work on it even after the end of the project, and as before I welcome any contribution and suggestion.